We are a local florist, owned and operated by the Ozment family, with four real brick and mortar flower shops locations near Grandview Heights. We Deliver in Grandview Heights everyday of the week including Sunday. If your need same day delivery or express delivery, we can that as well. Since 1990 Flowerama has been the florist of choice for Grandview Heights and has won the Consumers Choice Award for six years and counting. 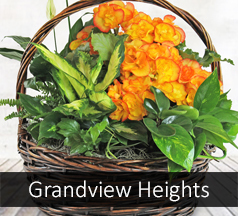 The design team at Flowerama named "Sun-sational Grandview Heights" after the town, shop for this arrangement and more online or simply call 614 256 6646 and your gift will be on its way. We also provide daily flower delivery to Grandview Heights businesses, Grandview Heights funeral homes,Grandview Heights schools, and Grandview Heights nursing homes.